← Do you dare to wear a granny square? This entry was posted in Knitting!, Tea Cozies!. Bookmark the permalink. I love all your crochet goodness! And of course Raymond! Oooo Alice this cosy is my favourite!! Unfortunatley it would drown my likkle teapot for one! Happy blog birthday and thanks for the inspiration and adorable posts!!! Happy Blogiversary, it’s cool when you realise it’s being going that long hey? I would love to win your cozy as I’m a not very confident knitter and a crochet wanna-be. Once again you have created another work of art! I’ve been reading your blog for about 6 months now and am constantly inspired by your creations (and I like reading about Raymond’s antics too!). Happy first anniversary!! Congratulations Alice! A year!! Woo-hoo. You have no idea what little rays of sunshine you bring to my life when I see you have a new post. You have inspired me so often. Loving the new cosie! She’s a beauty. Without a doubt I would LOVE to be entered into your give away. Long may you post away. Has it really only been a year? Feels like I’ve been following your blog for much longer! Anyhow it is always one of my favourites to click on, I love all the pics and seeing a tiny bit of your life in NZ. Oh and the teacosy is made of awesome, I need to make one of those!! I’ve only just recently found your blog and I am tremendously happy about it! Keep it up! Happy Bloversary!!! love it, love you, love KB, love Raymond, and that tea cosy needs to be in my house on one of my many naked cold lonely teapots!!! love this new cosy, fine colors too. Thank you, thank you , thank you. I’m absolutely in love with your tea cozies. I have been looking for a tea pot and I ‘ve never imagined how difficult is to get one here but I’ll keep looking for it!!! .I promise to try it as soon as I get it!! Happy 1st and may there be many more. Now Raymond, you know you’re the kleverest kitty in kiwiland so see if you can fix it so I get a good chance to win that gorgeous tea cosy. Seriously though Alice, the cosy is a beauty and you make it sound as if even I could make one. Thanks for the tutorial. Happy Happy! I wish I could make that…thanks for the pattern. I cannot knit. I’ve tried…no luck. Maybe my heart isn’t into it? I don’t know. My true love is crochet…can’t help it. But….enter me please! I’d love to win the cozy. Thank you!! Happy blog birthday! Love the way Raymond sneaks into the picture :-). i am happy happy for you ms alice, and even happier for the sweet lucker who wins this darling little cozy. i must get a teapot now, as i was only just on the phone talking teapot talk to my motherinlaw. . done and settled. this post a sign of the clearest kind. one year! your blog looks like 10. my my you are a busy gal. That is such a gorgeous tea cosy. I have only recently found your blog which is lovely to read/follow. It is amazing what happens in a year and having a blog is such a great way as you say to see how you have developed in your craft. Congratulations on one year!!!!! An achievement, I have started a blog but only blogged twice……very sad. I have to say that you have inspired me to crochet again and slowly it is coming along. Well done and keep going, really enjoy your stories! Mr. Raymond, it has been indeed a pleasure to have you grace these lovely pages! I have enjoyed every visit! Happy Anniversary ! Am looking forward to the next year! Wow, one year of creating your wonderful, inspiring blog posts! Happy 1st birthday to Crochet with Raymond!! I love your blog. I forget how I stumbled across it now but so happy I did. It has been a joy to join you on your knitting and crochet adventures …… and to hear of Raymonds wanderings around the neighborhood! Thank you for the time and effort you put into sharing your creations with us – it is enjoyed immensely and very much appreciated. So very pretty the teapot cover, very girly, I bet my mom will love this. I love coming here to read and get a boost of colour!!!! I am so glad I have found your blog- I truly enjoy your perspective on things! HAPPY ANNIVERSARY!! That is one very cute teapot cosy. Yes so much has happened in the past year out in the big wide world and in yours, it is all recorded for you to look back on and see how much you have achieved. The last photo show cases some of the things you love, Crochet, Knitting, Tea, Flowers and Sir Raymond. Alice, First of all Congratulations on One Year of blogging, posting, being incredibly creative, funny, charming, and a bright spot in my day. You guys sure made a beautiful staging for your photo shoot. The polka dot cosy is amazing and the color choices perfect. I’m in love with it! I would love to be included in your giveaway and thank you for this great chance to be a winner to Alice and Raymond’s world of tea cozy’s. My inspiration! Have a great day and hurray for you and all your stats! Those stats are amazing!! I’ve only just found you and I love reading your blog, you’re on my list of favourites. I’m only a teeny bit envious of the wonderful yarns you have…. but I’d still like to be chosen for this spotty wonder too..
congrats on a year of blogging! i love popping in to read your colorful, enthusiastic posts. they make me smile. i’d love to win this cozy. tea time is one of my favorite things! Happy anniversary!!!!!! I do love reading your blog. I live in the USA and marvel at how beautiful your country is and how gorgeous your crocheting/knitting is. I too, am a cat lover and your Raymond is truly a looker. So glad he protects you and his territory from all dangers. Have a glorious day! Happy blogaversary! I always enjoy reading your blog, so I hope you will keep on blogging for many many years! Happy Blog Birthday!!! I hope you have many more blogging years. I have thoroughly enjoyed reading about your knitting and crocheting experiences. This polka dot tea cozy is so cute! If I didn’t have blogs like yours to read, I too would have already become bored with crocheting. Thanks for all your inspiration. Isn’t it wonderful to make it an entire year? I started blogging last April, and love it! Happy First Blogiversaryday! I hope you enjoy the next year of blogging as much as you have the first year. Love the tea cosy, very, very cute! I missed your post about Raymond’s antics yesterday, he sounds like such a character 🙂 and he makes a jolly good prop for pretty photographs doesn’t he! The teacosy is oh so pretty. I love to drop in here. So happy blogaversary from my little corner of the world. I’ve realy enjoyed reading your blog since I discovered it several months ago, and I want one of those cosies very badly. My Torry says hello to Raymond (and she doesn’t speak to just anyone!). Happy Blogiversary to you Alice & to Raymond, too! I found your blog a few months ago through Lucy’s Attic24 blog. Your projects have been inspiring to me & all of Raymond’s handsome photos have been admired & patted on-screen by my 5 kitties. What a treat if I were to win the tea cozy, but just in case I don’t, I am starting one of my own today. Thanks for sharing your world with us. Happy Blogaversary! I have to say that I am so happy to have been able to share this journey with you! It’s been wonderful! Congratulations on a whole year of blogging and what a superb prize! It would save me so much time if I won this rather than having to make one myself …. Love the cozy! It’s adorable 🙂 Happy blogiversary!! Another coup for the talented Alice! You, Go, Girl! And Raymond is looking as handsome as ever. What would we do if we could not get our periodic crochet/knit/lovely words fix? Happy 1st Anniversary (or Birthday) to your blog. Love the cozy, I think I might attempt one for Josie’s moving to London for college. I think her room in the Halls will need something like that to remind her of home!! Very pretty pattern Alice- Raymond seems to think so too! MEOW! Happy anniversary! It’s always a pleasure to read you’re posts and so inspiring. I have to borrow my brother’s internet right now so I don’t get to pop in as often but it sure lifts my spirits when I do. Thank you for all the loveliness and I look forward to more! A year! Congratulations! I am so glad to have stumbled across your blog. I always look forward to seeing what you and your family are up to. Your fiber craft is gorgeous and inspirational. Thank you for sharing tidbits of your life with us! Well, I hate to admit it’s taken me 365 days to discover your beautiful blog 🙂 I will be a regular now that I found you. Thanks for all the beautiful patterns you share. And happy anniversary! I linked to you on Facebook. How adorable! I need to make a cosy for my teapot! Happy Blog-aversary! Your little polka dot tea cozy is absolutely adorable. I love it! And the granny bunting has been put on my to-do list too. Yay!!!!!!!!!!!!!!!! Happy 1st blog birthday! 😀 This tea cozy is just darling! Thank you for such a great year of yarn, knitting, and crochet goodness. I love checking your blog to see what is new in your world 🙂 Have a great day and give Mr. Raymond love for me! Wow a whole year well done. Haven’t you rammed a lot into it too? Happy Anniversary! I am so glad I came upon your site. I look at it every day! I crochet more than ever, and appreciate all your patterns and ideas. I am going to try to make a tea cozy myself. Wish me luck!! 🙂 Give Raymond a hug! Love all you do! Happy 1st blog birthday Alice. I love reading your blog whether it be about crocheting, knitting, walks, pictures of your beautiful country or, of course, gorgeous Raymond! Ooh enter me in this fab giveaway please! I am in love with this teacosy!!! Oh Lordie…I love that polka dot tea cozy to pieces. Congrats on your blog birthday! I am not a blogger, and cannot crochet, but I am compelled to look at your blog every day, its the first one I read from my favourites bar. I love the colours, the contents, the handsome Raymond. What is there not to like. Please keep blogging. Happy Anniversary! Love the tea cozy and I’m sure my Brown Betty would too! Thanks! I really enjoy your blog & Happy Anniversary. I live in Rossendale, Lancashire in the UK. My sister & husband live in Aukland, and after i saw your post the other day about Possum Yarn, i`ve asked her to bring me some over to the UK when they are over for a visit in August. Keep up the good work. I`d love to win one of your teacozies. Oh I love this tea cosy mmmmmmm Happy anniversary!!!! Happy first Alice! Although I only found your blog recently, I check in everyday to see what is new with you and Raymond. I love your blog and hope you will continue with it for many years to come. 🙂 I love your latest tea cozy and would like a chance to win it please. happy anniversary!! smooches to you all! Happy blogoversary Alice and Raymond! Can’t believe you are so young -not that you look old of course! Happy blogaversary! It’s nearly mine as well. It’s completely sneaked up on me and so I don’t have anything to do a giveaway with! Best get hooking. So love the tea cozy, I love spots! Pick me Raymond Boy! Thanks for the year of happiness you have brought us. I’m drawn to your colourful door for a visit often. Let’s hope you will enjoy many more blog birthdays, as the world is a brighter place for your being here. Happy Blogoversary, Alice (and Raymond)! It has been a treat to read you, a visual feast to peruse your photos, and an inspiration when I’m looking for “the next project.” Here’s to another year full of yarn bliss! Congrats! You touch so many, many people in such a positive way and the world needs that in truckloads right now. Purrful greetings too from Jazz and PG…..they love Raymond too in a non-territorial way you understand! Looking forward to thenext 365 days…. If only I had something to keep by tea warm between posts! I love’s all your knit and crocheted items! It’s amazing that there are so many other “yarnaholics” out in the world. I’m also happy that your post on your blog at least a couple times a week! Bravo for doing that! Happy Anniversary. Love your blog and what an adoreable tea cozy!!! Would be so proud to show it off. Thanks so much for the pattern and opportunity to win it. Happy Blogaversary Alice, love the new tea cosy and I think Raymond is looking as if he has given it his seal of approval too. What a great looking tea cosy too! Pat yourself on the back. A year of blogging which has been a year of reading for me! Thanks to you and Raymond. 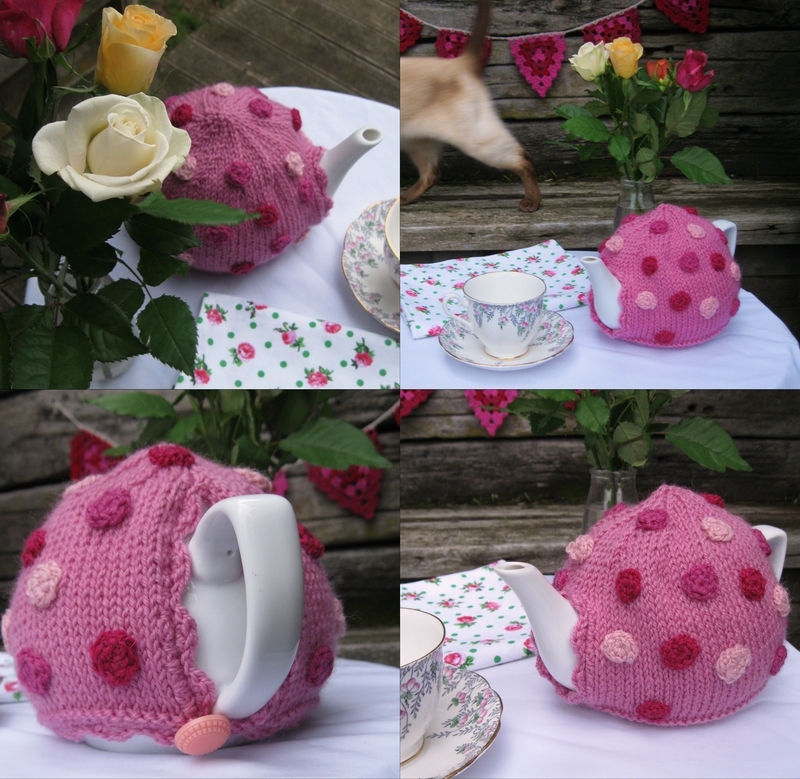 I would love to win your spotted tea cozy–my little craft business is called Dot’s Daughter! Squeeeeeeeeeeeeeeeeeeeeeeeeeeeeeeeeeeeeeeeeeeee i LOVE that!!! It is ridiculously gorgeous!!! I might have to start a new project to continue while I am in hospital again!! I see a few of these being under the Christmas trees of people I know this year!!! I still can’t believe you’ve only been blogging for a year. You’re a natural! That tea cosy is so cute! I especially love the pretty table you put together to show it off. 🙂 Happy Blogiversary! Happy Blogoversary:) I would love to have such a pretty tea cozy and I would love to have Raymond but I guess he’s not included. Love the picture of Raymond waiting to have his cup of tea poured. Hope you don’t mind him drinking tea out of your Nana’s teacup. Happy blogiversary. Your blog is awesome. Happy blogiversary! Just want to say thanks for taking time to create such an amazing place. It’s so happy here. No matter what kind of day I’ve had, I come in, and this place gives me peace. I love all the amazing colors, the beautiful projects, pictures, and stories.. oh and the chocolate muffin recipe! yummie! Happy Blogday dear Alice and Raaaaaaaaaaaaaaaaaaaymond! Luv Debbs x Now where’s my cake? Happy Birthday and the tea cosy is fab! Thank you for giving me many hours of reading, lovely photos of Welly, crochet inspiration, eye candy in the form of Raymond and fun. You two brighten my day. Happy whole year blogging. Greetings from Florida! ^_^ Congrats on the anniversary and thanks for the epic awesomesauce posts!! A big hourra for your first anniversary on Blogland! Bravo! You write wonderful posts and it’s a joy to read your blog every week. Nice people like you bring happiness to my life and help me to forget the daily stress and see the beauty of every day life. Please keep on blogging, I love it! It’s great to know that the love for crochet and knitting is worldwide. Happy Blogiversary! Congrats to you! Your blog never fails to cheer me up! All the lovely colors and then there is Raymond! Beautiful tea cozy! Have a wonderful day! Congrats Alice and Raymond. I look forward to your posts and have made the crochet tea cosie and the mandala so far. I’m working on yet another knee rug which is what Im addicted to. This one is in shades of green as i figure it may be OK for for ladies or gents. I work in an aged care facility and thought I would donate this one to keep someone snuggy in our very cold Tasmanian winter. I love the little snippets about New Zealand and have just read today about the number of buildings that have to be condemned in Christchurch. From little things big things grow so we hope a bigger and better Christchurch will rise. All the best from Tassie. Wow Alice where has the time gone? Happy Birthday to your blog! You truly have been an inspiration and great to communicate with and get to know and you’re right about the comments, without those I probably would have fizzled out sometime ago. 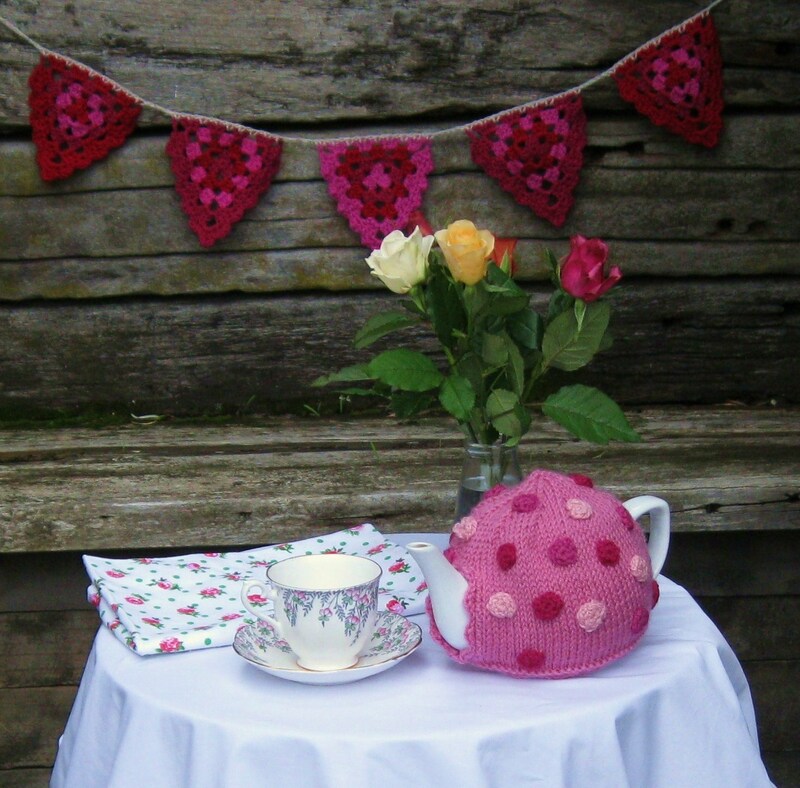 Love your tea cozy … oh so pretty and dotty. Who could not love a polka dot? Thanks for sharing the pattern too. I forced myself to crochet the shell edging on one that I have almost completed, just need to decide on a finishing touch or two. Thank you for the wonderful tutorials, this tea cozy one, and all the others you do! The colours of your mandalas are inspiring and beautiful. I enjoy your blog very much and all the wonderful photos. Also the photos of lovely Raymond are perrfect. Your blog is a great pick-me-up for me. I hope you continue it! Thank you. Always bobbing in to read your blog. Love cats and Raymond is simply gorgeous.A master at posing. of course, I would just so love your tea-cosy to warm my tea-pot here in the UK. Its feeling cold and in need of a new coat. many best wishes , so enjoy your socks too. Greetings from Canada. Just recently found your blog through Attic 24. There are so many crochet projects of yours I can’t wait to make. But the Polka Dot tea cozy is my favourite so far. I love polka dots and I love tea. However, since I don’t knit and my daughter is only just learning to knit, it will be a very long time before I can make my own. So, to win yours would be fabulous. Also, congratulations on one year of blogging. Can’t wait for more. I love your “dotty potty” tea cosy and your blog! Happy Anniversary! You must feel so proud with everything you’ve done over the past year. I’ve been reading your blog for a while and have recently been inspired to start my own. It’s very early days for me but I really hope I’m still going in a year’s time. So far I’ve made a tea cozy and a coffee cozy thanks to your inspirational blog XD I’m right this very minute making up some pointy petal flowers too! I love the way you carefully style your photoshoots – it’s like reading a high quality magazine! Congrats on the impressive stats after your first year of blogging. Looking forward to the next year. happy first blog anniversary…thank you from BC Canada for the wonderful tutorial so kindly given and well as chance to win your wonderful tea cozy..Please Raymond a big kiss from across the pond..handsome fellow that he is! Happy Anniversary and thanks for the pattern!! And count me in !!!!! Happy First Year Anniversary. I love your blog and found it while searching for patterns for a tea cozy. I hope I win your pink polka dot creation because it is gorgeous. Keep blogging because I truly enjoy reading your blog and seeing what mischief Raymond has gotten into. Love your patterns and I look forward to seeing what you are making. Thank you for sharing your creativity with all of us. Congratualtions on your very first anniversary- and cheers to many more!! Love your blog, love the cozy, and love, love, love Raymond!!! Happy day indeed, congratulations and please keep going some more years! Plus: I want to win! Congratulations on a fantabulously fantastic year of blogging! I love your blog and have been thoroughly inspired by you over the last year. It has been a utter joy to check in on you and your lovely Raymond each day over this last year. I have only just discovered your blog & was inspired by it instantly: went out to buy yarn in lots of colors! I love the teacosy. I made a teacosy recently and love how it looks on my teapot. Had the idea of buying many teapots at second-hand-stores and making many cosies for them. Now I am really going to do that and try out your new pattern! Happy Blogiversary..!! I do love reading your posts as they appear on my phone, I read them once through on there and then on my laptop when the lovely pictures are a bit bigger..! Congratulations to you! I love your knitting, your crocheting, your cat, your generous spirit, your attitude on life and everything that makes you YOU. Even though I don’t knit at all, only crochet, I so love reading your posts and seeing what neat new creations you are making. You have such a way with color and taking the pics and everything looks lovely. I also love your writing style. You make everything so interesting. And, of course, there’s Raymond and his adventures. Happy blogaversary! I enjoy your blog – I like reading about your yarn related adventures from the other hemisphere on the other side of the world. I love this tea cozy. I have a thing for dots anyway and lately I have been all about adding touches of pink to my home. Congratulations on your anniversary! I LOVE your blog, and I always look forward to my e-mail notifications telling me you have a new post. I started out as a crocheter, and thanks to you, I’m finally a knitter, too! Keep your pics and posts coming! Happy One Year! Love your blog and the tea cozy. Happy Anniversary! I enjoy your post and look forward to each new one. You are very inspirational and I love your creativity. This cozy will hopefully stimulate me into making some for Christmas presents to go with my homegrown teas I share. Congratulations! Please keep on doing your blog! I love it so!!!!! I pop by every few days just to see what’s going on and find out what kind of mischievous sweet Raymond has been up to! I enjoy your projects and love your color sense. I would miss you if you left. Congratulations on one whole year of blogging! When I discovered your blog some months ago, I went back and read it from the beginning. It always lifts my spirits when I get to read about your projects and Raymond. He is a magnificent cat! Beautiful tea cozy today as well! 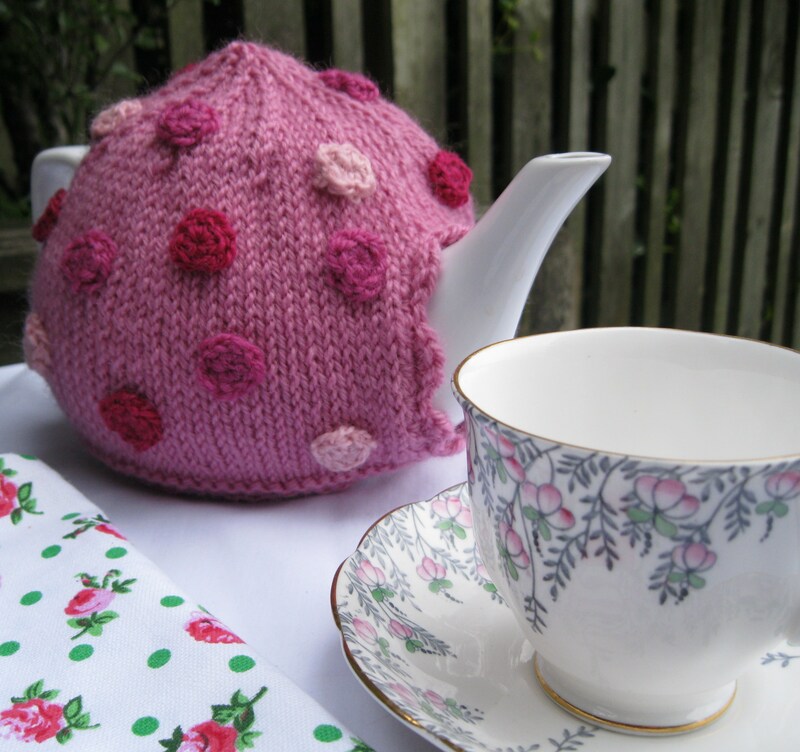 Love the pink ‘spotted lady’ tea cozy…… and smiled when I saw a china teapot of the same shape but in blue colourways (with spots of similar size, too) at my supermarket the following day! I was tempted to buy, but on second thoughts ……..Mmmmmmm perhaps a pot with a cozy of the same pattern might be a ‘spot too far’??? Raymond looks a bit bemused (big pic.) that the focus of attention is not on his handsome self…. Happy Happy Blogaversary!!!! I have enjoyed reading your blog and have found so much inspiration for my projects. Keep up the great work! Reading your blog makes me happy……..
Oooh how exciting! That is the most beautiful tea cozy I’ve ever seen! I’ve never actually owned or made a tea cozy so my fingers will be firmly crossed! Well done! I love your tea cozies. I made the granny square one, but I’m not really confident enough about sending you a picture. Thank you for getting me back in to hooking though. I will closed my eyes and click my heels together on prize day and hope that I get picked be the recipient of this lovely creation. Congrats! I adore you & Raymond. Of course, how can anyone go wrong with fab yarn & a very handsome cat? Your color choices always make me very happy…so bright and beautiful. You have inspired me to attempt knitting socks…again. Really just a year? Thanks for showing us all your wonderfull creations, it´s always a good inspiration! Happy birthday! Congratulations Alice! Let the next year be as productive as the last. The tea cosy looks lovely, but the competition is pretty stiff. Here’s hoping! Wow! Congratulations at your 1st birthday! Time flies when you fill your life with things which you love and inspire you! And, I want you to know that you inspire me! I always smile twhen I receive your posts even before I open them, just like getting a present! Thank you for opening up your home and life to the world! Big hug to you, KB and, of course, to Raymond, who always watches over everything! Love escaping to your website for a bit of encouragement when that harsh, cruel reality threatens to grind you down. Don’t see anything wrong in knitting a curtain and resent the insinuations that i’m completely nuts from my 17 year old son. Note to self: hide the linen towel I’m now doing until he’s at college. Some people have NO imagination. Love the bunting. Went a bit mad for the Royal Wedding. Looking forward to your next 12 months. Congratulations on reaching the one year milestone on your blog! I love reading your blog! You make such lovely things and I love seeing what Raymond gets up to! Happy blog birthday! What a gorgeous tea cozy!!! I A-D-O-R-E it!!! I will definitely try to make one. Your nana’s tea set is gorgeous too!! Congratulations on your first year’s birthday and on the success of your fantastic blog. You have brought me joy and a lot of inspiration throughout the year so thanks very much!!! I have now finished uni for now (but have postponed the exams for next spring). The baby is due soon and didn’t need the added stress of the exams. I am therefore trying to catch up with blog-land (as I’ve been increadibly busy recently with assignments) and trying to get ready for the arrival of the baby. Will keep you posted!! Once again Congratulations and look forward to reading more posts from your side of the world. Congrats on 1 year blog-a-versary. I just recently found you, and have been feeling like I am in absolute COLOR HEAVEN. I would never think to put these colors together, but love, love, love the happy combinations. Thank you for sharing your patterns and talent! I have a little Scotty dog, Duffy, who adores anything I make and claims it for his own. It’s nice to have such an appreciative audience! Happy blog-versary to you and many more!!!!!!!! I soooo love checking in with ya. Happy Anniversary!!!!! happy bloganniversary!!! Hope you blog many years more and thanks for the pattern! But I also love the chance to win one made by you!!! Happy first blog birthday! I’ve been crocheting your patterns all this month :D! I don’t think I’d enter in the giveaway since i live in mexico, but just popping a comment to let you know i love your stuff and Raymond’s happy kitty face. As a casual crocheter (not nearly so experienced as you!) I thoroughly enjoy reading your blog. I especially like your gorgeous photography of both yarny items and Raymond. You have a fan in the Big Apple! I don’t know if you want to ship that beauty all the way to the US, but I sure do have a tea pot it would fit cozily around. Happy blogiversary, only discovered your blog a couple of months ago and I’ve been enjoying going through the archives and being inspired. Love the pink polka-dottie goodness. Kindest regards from darkest Yorkshire, England. The polka dot tea cozy is adorable! Thank you for sharing the directions! Congrats on your one year mark! Polka dots… just precious…love it! I love the tea-cosy – very cute. And just in time for Australia’s Biggest Morning Tea on May 26 (I’m sure NZ does something similar – perhaps the cosy could be used for that? It is beautifully pink). I also found your blog via Attic 24, and like many other reader-commenters have some flower shawls queued up. You have also sent me blog-hopping & searching for possum-merino yarn, so I foresee some projects using that. Love the tea cozy, and thanks for the pattern! I plan on making this this summer since I am now learning to knit! Thanks for your blog- found you through attic24. Congrats on a successful year and I love the polka dots! Of course I would like to take a chance at geeting your tea cosy. I love the colours you use and your blog is very inspiring. Wow Alice – what a fabulous year you have had. I only found you a few months ago but have been a huge fan ever since. You have started an absolute tea cosy obsession in my home and your new design is utterly, utterly adorable! I’m guessing you’ll be making another spotty one to grace your kitchen – as it will be very hard to give this one away!! Take care – stay warm, boy it’s chilly out there today! Well Alice… congrats on your blogaversary. I love-ah this technology that can connect us crafty ladies from all over the world!!! Making a good friend one of your rose tea cozies. Your blog makes me smile every day! Happy blog birthday! I love your blog and it always makes me smile when i see you have a new post. Here’s to another yarn filled year and lots of raymond adventures! Beautiful! Like all that you knitt and crochet. I enjoy very much your lovely blog! Congratulations! Congratulations on your blogiversary!!! What a beautiful teapot cozy. If only I wasn’t so terrified of knitting, I would give your wonderful pattern a try. Have you ever made a crocheted teapot cozy? I only recently found your blog, and read it from the beginning to present posts over one weekend! I simply could not stop reading! Happy blogbirthday!!! Thank you so much for sharing your adventures with wool and Raymond with us all, I find your passion for colour inspiring. I love your tea cozies and the colors of the yarn that you use! Could you please tell me what brand and colors of yarn that you use? I want to make your tea cozies and would like to use the colors and kind of yarn that you use. It is so beautiful-your patterns and colors that you have put together. Thank you, Deborah Townsend. Raymond is a very pretty cat! Hurrah for you!!!!!! I am a recent convert to crochet…I can’t follow a pattern and I forget what stitches are what but it will be great to read your blog and be inspired. I am eager to start a rag crochet rug, then flowers for my tea cosies, then an inspired shawl for me, then and flowery rug for one of my very best friens…oh my list is endless. Thank you for being and inspiration!!!!! Pingback: Polka Dot Passion with 14 Free Patterns!